Within the framework of this project, architecture and art are found side by side, are entangled, extend and complete each other in order to create a common language, a synergy which creates an intriguing, vivid and dynamic, yet at the same time intimate, welcoming and friendly ensemble. 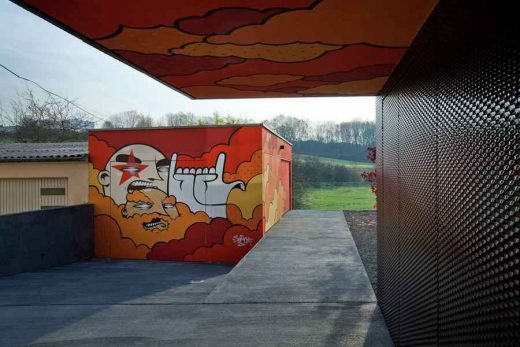 The reflection on the relation between art and architecture is part of the concept created with the involvement of the Luxembourgish artist SUMO. It is a response linked to the evolution of the urban landscape because the era of the “post-graffiti”, even if many refuse to admit, has become an integral part of the city. 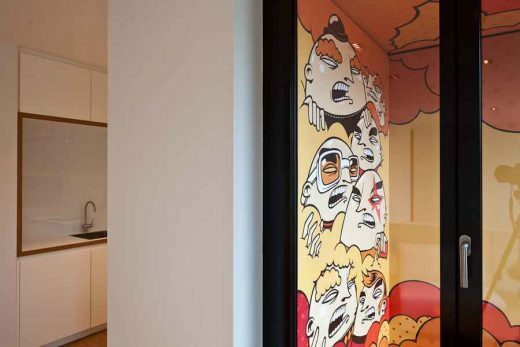 Sumo voluntarily covered the space from the ground to the ceiling with his artwork in such a way that his art, which one can consider being “post-graffiti”, is subtly integrated in the built space. Architecture gave way to art which reveals itself at times under the overhanged volumes with yellow, orange and red clouds, at times in the background of the loggias of the apartments with its peculiar figures. Art emphasizes this formal game of the spaces that seem to have “slid” to give way to the organic sketches and eccentric colors created by the artist. This cooperation puts forward the idea of the existence of equilibrium between the development of our building landscape and the artistic interpretation. 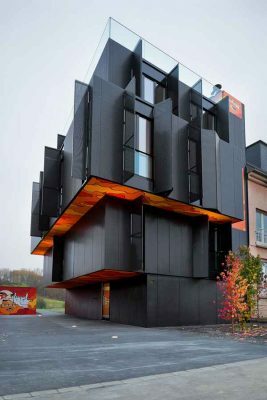 The monolithic aspect of the building strongly opposes the neighboring building by its form as well as by the materials used. 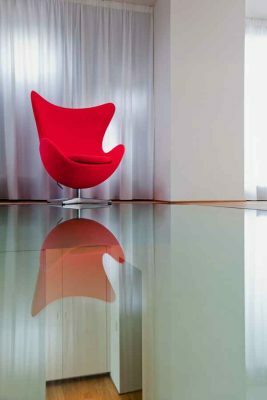 The project presents itself as a unique object characterized by the juxtaposition of simple and pure volumes. This aspiration stems from the ambition to set the building off from the banality of the neighboring architecture. 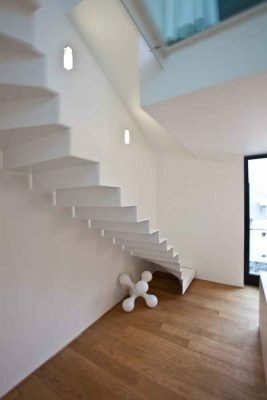 Generally speaking, in the surrounding architecture one can see a clear distinction of the materials used for the different floors and the roof. 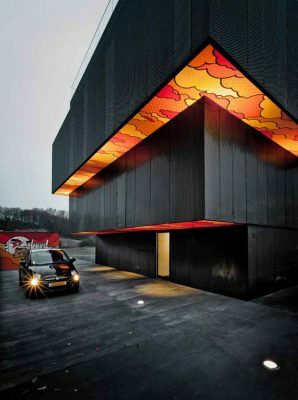 In this construction the use of a unique material, black shiny extruded metal, gives it its monolithic and sculptural character. During the day, when the weather is nice, it delivers a warm and intense color, which, with its sharp corners, creates a strong contrast with the absorbing materials of the neighboring buildings (such as the plaster of the facades). During more bleak weather it merges with the color of the sky. At night, it is more discreet, as it allows itself to be illuminated by the city lights and the passing cars, and sometimes it illuminates the artist’s artwork itself. 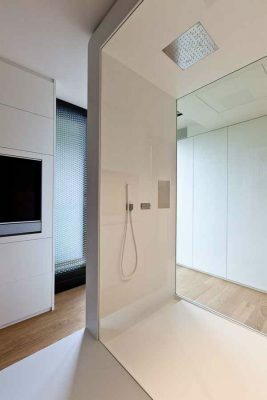 Sliding panels allow the residents to be in relation with their environment. Seeing without being seen or being seen without seeing? The ambition was to free the three facades of the building from the circulation spaces in order to create maximum flexibility and luminosity for the apartments. The narrowness and the exiguity of that part of land encouraged the development of 4 differently sized and individual apartments. Considering the proximity to the road, the resulting lack of intimacy and the weak exposure to sunshine, we preferred the idea to use the ground floor for the garages. On the first floor, a two-bedroom 80sqm apartment is designed for a family of three. Thus, the rooms are isolated at the back of the building in order to ensure intimacy and well-being. A open space, is oriented towards the road. On the second floor, thanks to a 1m overhang on 3 sides of the building, we suggested building 2 studios, 47 and 48sqm respectively. These seem destined for young couples without children. Considering the narrowness of the apartments only the bathrooms are separated by wall whereas the rest of the space is structured using furniture, assigning the different functions. 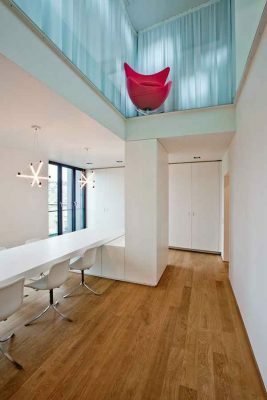 On the third floor we come across a 115sqm duplex apartment. 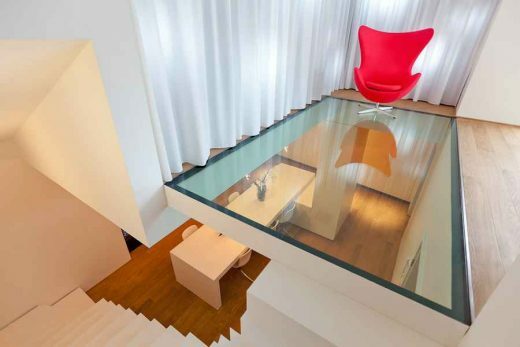 A sturdy all-glass ceiling ensure the sunshine to get through to the north-oriented kitchen and dining room.